Sensational statue spotlights the vain and evil queen. Note the highly detailed gown and dramatic cape. Who's the fairest of them all now? Snow White's menacing villain commands respect and attention in her elegant and highly detailed gown. Her floor-length cape creates an especially dramatic backdrop, updated with a tonal deco pattern and red lining. 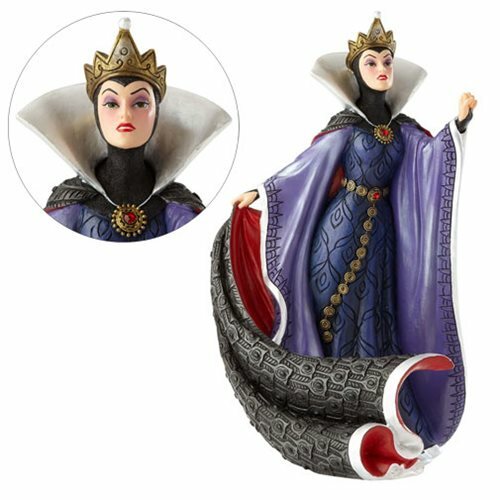 Faux gems and an ornate belt give the final luxe touches to this sensational Disney Showcase Snow White and the Seven Dwarfs Evil Queen Statue. Crafted of stone resin, she measures about 8 1/2-inches tall.